The Romería de El Rocío is one of the biggest and most famous romerias in Spain. If you are in Andalucia during that period of time don’t be surprised to see people passing by on the horseback or in horse-drawn carts. El Rocío: What, when, where? La Romería del Rocío which is also sometimes called La Blanca Paloma (The White Dove) is the annual celebration which brings together religion by honoring the Virgin of Rocio and festivities. It is procession which brings around one million pilgrims every year. The celebration dates back to XIV- XV century when the wooden statue of the Virgin Mary was found by the hunter from Villamanrique village. It was and is believed that the figure helps with infertility, disorders and different diseases. The actual celebration takes place over the seventh weekend after Easter Sunday or, in other words, 50 days after Easter Sunday before Pentecost Monday. However, in reality, everything starts more or less week before when believers in Virgin of El Rocío heads from their provinces of Andalucia such as Huelva, Seville, Cadiz, Malaga to mention few, towards the village of El Rocio where the statue is placed. The figure of El Rocio is held in the big church which is called the Sanctuario de Nuestra Señora de El Rocío which is also referred as simply the Ermita. The small village of El Rocio is located 17 kilometers from the town of Almonte in the province of Huelva which is on the southwest side of Spain and shares the border with Portugal. During El Rocio be prepared to see lots of horses, donkeys, oxen, gypsy style carts, people wearing traditional flamenco costumes and singing so called cantos and coplas, the typical flamenco songs. You might encounter a bunch of camps built by the pilgrims where they altogether share food, drinks light the bonfires and dances and sings. 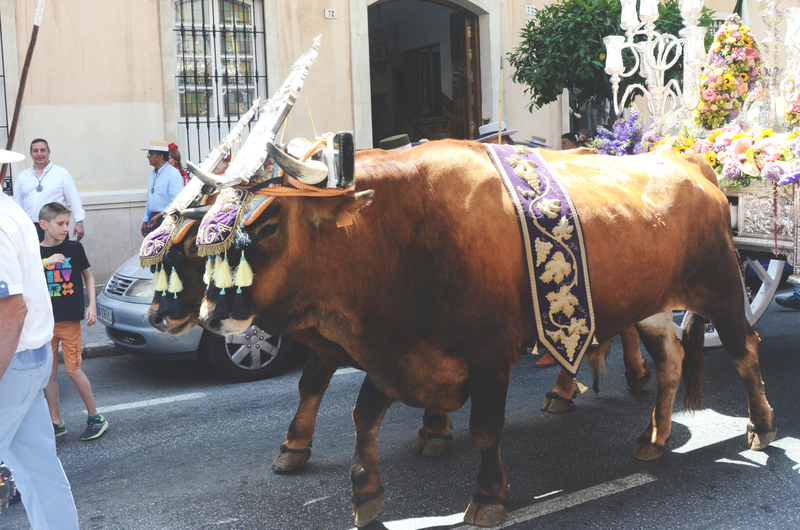 On Saturday when everyone arrives at the village procession takes place where everyone participates and when the statue of the Virgin Mary is taken from the church and ends on Monday morning when the statue is placed back to the Ermita. During those days everyone prays so at the culmination of the celebration it is believed that everyone is without sins called Simpecados. So when the last Simpecado enters, the virgin sculpture enters to the church and everyone starts shouting ¡Que viva la Blanca Paloma! With this, the celebration ends and everyone starts heading off from Huelva to for another big celebration. Next Spanish – How to Learn?